Bruce Beck welcomes us and hypes the main event of Mark “The Hammer” Coleman vs. Dan “The Beast” Severn to crown the first UFC heavyweight champion. We will also see the debut of weight classes in UFC with a heavyweight tournament, as well as a lightweight tournament for fighters under 200 pounds. Color man Jeff Blatnick calls the weight classes a great idea. Joe Rogan from the NBC comedy “NewsRadio” will handle post-fight interviews. He seems to know his stuff…maybe he’ll stick around! Ken Shamrock is also at ringside on color commentary. He picks Severn to beat Coleman in the main event. Manny Garcia is our ring announcer, and here we go! Martinez is 9-0 as an amateur kickboxer to go with two Arizona state wrestling titles. He says his plan is to do the opposite of what his opponent wants to do. 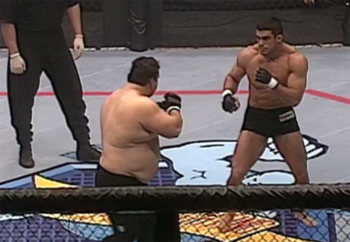 Bohlander is 2-1 in the UFC and reached the semifinals of UFC 8. He’s from Shamrock’s school, the Lion’s Den in California. Bohlander gets a single-leg takedown and dominates the fight on the ground. After losing control for a bit, Bohlander takes Martinez’s back and wins it with the rear naked choke at 1:24. Shamrock has fought Takahashi four times before. “I’ve hit him with some great shots and he wouldn’t go down.” Garcia announces Tanahashi as being in the top 10 in “pancreas.” If he fought Bas Rutten, he should watch out for the liver kick.